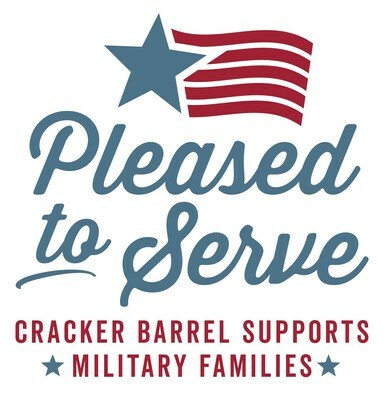 LEBANON, Tenn., April 17, 2019 /PRNewswire/ -- As part of its long-standing support of America's armed forces and their families, Cracker Barrel Old Country Store is donating Heat n' Serve Easter Family Meals To-Go to up to 5,000 military family members this weekend. To further its mission of building strong, stable and secure military families, Operation Homefront joined Cracker Barrel in identifying key areas around the United States where military families have the greatest need, helping nearly 1,000 more people than last year's Easter meal donation. The families invited by Operation Homefront to participate will pick up their holiday meals on Good Friday, April 19. The meals are designed to be refrigerated at home until families are ready to enjoy them for their holiday celebrations. With the ease of simply warming up each dish, families will be able to enjoy a warm meal, without hours in the kitchen. Each of the 500 donated Heat n' Serve Easter Family Meals To-Go serve up to 10 people for 5,000 people in total and includes spiral sliced ham, mashed potatoes, roasted gravy, three country sides, sweet yeast rolls and two buttermilk pies. "Knowing the sacrifice these families make to serve our country, we are honored to be able to serve them an Easter feast," said Cracker Barrel Manager of Corporate Citizenship Sloane Lucas. "With the ease of preparing these Heat n' Serve Easter Meals To-Go, we hope to bring military families together to spend more quality time with one another this holiday." For over 15 years, Operation Homefront has helped tens of thousands of military families with short-term financial needs, transitional and permanent housing, and family support programs including this Holiday Meals for Military distribution. "Holidays are a special time for families to come together – especially for those who have sacrificed so much to serve our country," said Operation Homefront Vice President of Corporate and Foundation Partnerships Jill Eskin-Smith. "We are grateful that Cracker Barrel remains committed to helping military and veteran families thrive in the communities they have worked so hard to protect." Since 1969, Pleasing People has been Cracker Barrel's mission. It drives the company's passion for helping people in the neighborhoods where it does business. Cracker Barrel is Pleased to Serve communities across the country by donating to charities and worthy nonprofits that help provide comfort to those in need. The company's main philanthropic focus is supporting members of America's armed forces and their families. Cracker Barrel and the Cracker Barrel Foundation have long supported military-focused nonprofits and charitable initiatives, including Operation Homefront, Fisher House Foundation, Special Operations Warrior Foundation, and The Legion Fund, among many others. By directing most of its giving to this area, Cracker Barrel believes it can make a real, lasting difference in people's lives. In 2016, Cracker Barrel selected Operation Homefront as its national nonprofit partner and has since donated over $1 million in financial support and goods. To learn more, visit crackerbarrel.com/giving. Cracker Barrel Old Country Store, Inc. (NASDAQ:CBRL) shares warm welcomes and friendly service while offering guests quality homestyle food and unique shopping – all at a fair price. By creating a world filled with hospitality and charm through an experience that combines dining and shopping, guests are cared for like family. Established in 1969 in Lebanon, Tenn., Cracker Barrel and its affiliates operate 659 company-owned Cracker Barrel Old Country Store® locations in 45 states and own the fast-casual Holler and Dash® restaurants. For more information about the company, visit crackerbarrel.com. Founded in 2002, Operation Homefront is a national nonprofit organization whose mission is to build strong, stable, and secure military families so that they can thrive – not simply struggle to get by – in the communities they have worked so hard to protect. Recognized for superior performance by leading independent charity oversight groups, 92 percent of Operation Homefront expenditures go directly to programs that support tens of thousands of military families each year. Operation Homefront provides critical financial assistance, transitional and permanent housing and family support services to prevent short-term needs from turning into chronic, long-term struggles. Thanks to the generosity of our donors and the support from thousands of volunteers, Operation Homefront proudly serves America's military families. For more information, visit OperationHomefront.org.